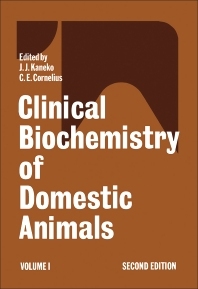 Clinical Biochemistry of Domestic Animals, Second Edition, Volume I, is a major revision of the first edition prompted by the marked expansion of knowledge in the clinical biochemistry of animals. In keeping with this expansion of knowledge, this edition is comprised of two volumes. Chapters on the pancreas, thyroid, and pituitary-adrenal systems have been separated and entirely rewritten. Completely new chapters on muscle metabolism, iron metabolism, blood clotting, and gastrointestinal function have been added. All the chapters of the first edition have been revised with pertinent new information, and many have been completely rewritten. This volume contains 10 chapters and opens with a discussion of carbohydrate metabolism and associated disorders. Separate chapters follow on lipid metabolism, plasma proteins, and porphyrins. Subsequent chapters deal with liver, pancreatic, and thyroid functions; the role of the pituitary and adrenal glands in health and disease; the function of calcium, inorganic phosphorus, and magnesium metabolism in health and disease; and iron metabolism.